Perfect words for the image Sarah. Nicely done. My pleasure. I think I will have my nature poem ready to post tomorrow. Am greatly looking forward to it. You can just keep that snow to yourself, and that dog looks evil! lol Beginning my week with your haiku is the perfect way to say HAPPY MONDAY! 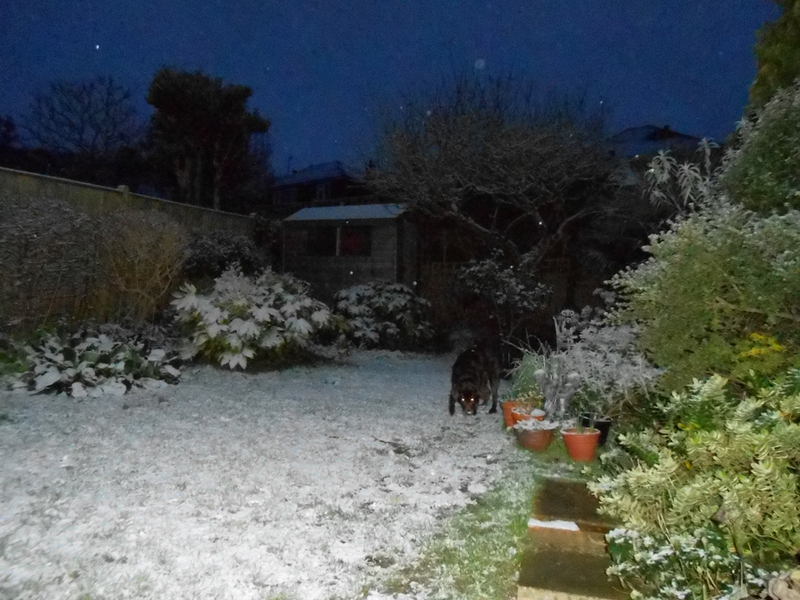 Don’t worry, it’s snow from a fortnight ago and my dear, sweet dog is quite th opposite of evil. Impish, yes. Puppy-like at the grand age of 10, yes! You have a wonderful week, dear friend! I love it. François took a picture of Zeke with eyes aglow… keeps it as his screensaver on his phone. Like yours, there is not an evil bone in his body. Happy week to you, Sarah! How lovely that François should have a picture of your dog on his phone. It sounds as if your big romance is still going good and strong 🙂 Happy week to you, too, Dale, and my huge apologies for being so neglectful of you. We will have girls’ facetime when I’ve finished my darned book. I’ve been really tired, with my brain only functioning on half-power. Have decided the culprit is the iodine in my multivitamins (will explain more when we talk). Since stopping taking the things, the fog has started to lift from my brain! Well…. it’s on a “let’s see where we stand” thing, actually – my having not totally digested his two-weeks in the sun and sand sans me. And so happy to hear the fog is lifting and yes, when you are able to, we shall have a girls’ facetime! Love this and the lamp eyes! Thanks, Andrew. I’ve only just found this comment of yours in my spam, along with two other comments. You must think me very rude in not replying to you. Not at all. My comments have fallen into so many spam folders. I hope you are well. I’m sort of well, but would feel better if the rain would ease of and let in Spring. My novel is also exhausting me, but I always get like that towards the end of a first draft, thinking I’l never type THE END before my energy completely runs out. LOL I get the same way when going through the early drafts. Best of luck with it. Hello Sarah: Love this post. “Luminous eyes pinprick night” – the beautiful ‘eye’ and ‘nigh’ rhyming. Explorer dog lamps – ha ha – love that too!